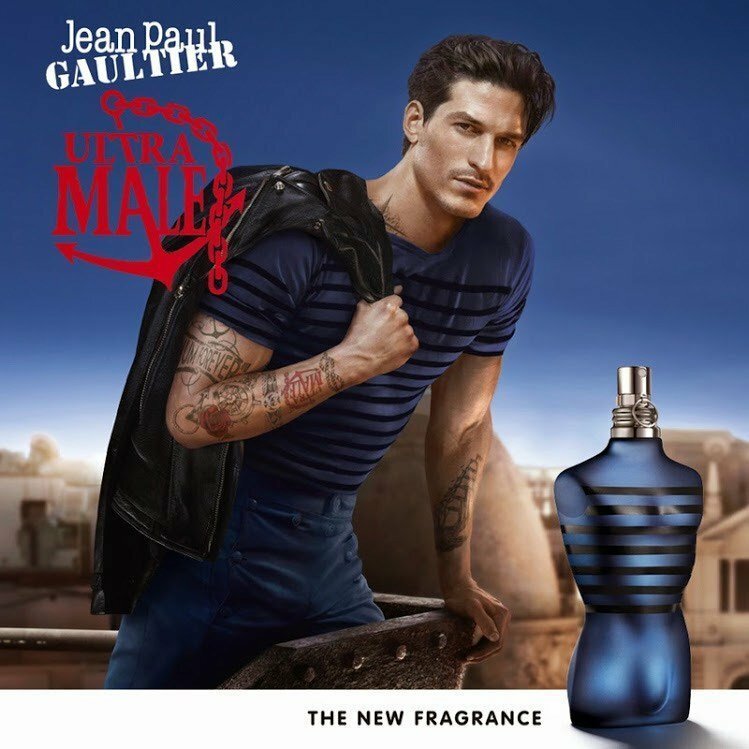 Ultra Mâle is a perfume by Jean Paul Gaultier for men and was released in 2015. The scent is sweet-spicy. Projection and longevity are above-average. It was last marketed by Puig. The face of the advertising campaign is model Jarrod Scott. "The sailor in search of adventures from the Orient"
I have this fragrance for a very long time because from him really 3-4 sprayers are enough he in my opinion otherwise becomes too intrusive. Nevertheless he is a really good fragrance and I have got a lot of compliments for him said he is a ladykiller and comes in women very well he looks masculine, strong and present but sweet, playful and in a single way mythical I have been told. The fruity pear is something very unique in the interaction with the vanilla, in my opinion the fragrance consists only of these two components. The Sillage is room filling and the shelf life very long lasting but it is not suitable for every occasion, perfect for the club, a date or on cold days also very recommendable for the winter or on cold nights. He has something of an oriental scent in my opinion. The price-performance ratio is very good and it could be marketed as Eau de Parfum. Who wears Ultra Mâle, needs a strong nose, because this fragrance has a lot of charisma, i.e. with "Ultra" JPG has already hit the right name in part. The start is clearly sweet, but in the frame. And at the end vanilla, vanilla and again vanilla, vvvoll cool. Wear this scent with 2 sprayers behind your ears when I want to smell sweet, and of course 2 - 3 more sprayers when going away. If something gets on your clothes, you may wash them immediately, because it will simply smell like UM, for days, weeks, years, decades, centuries, millennia, infinity, 2 times infinity. I must be honest and admit that women enjoy this fragrance on me more than I do. Very sweet & yummy kind of smell. It smells delicious. Because its sweetness I recommend this juice only for late fall and winter. Not that pricy. Performance : 8-10 hours. Good projection for 2-3 hours. At the 7th hour mark, It starts to become a skin scent. Not the most masculine scent, for real men. But girls love this scent. Some of them, are wearing this for themselves. Personally, I like to wear this when I go to the club, birthday parties or when I am cuddling with my girl (for this type of scenario, only 1 spray, instead of 3-4). This starts out almost too sweet, but the mid note is an addictive bliss that carries for a long time, intoxicating anyone who gets trapped in the sillage web you leave behind. Women LOVE this one. A fragrance, which in my opinion could have been marketed as unisex without problems. The fragrance itself is present from the first moment with its full sweetness. In my opinion he has nothing to do with his relative Le Male, except for the sweetness itself. It develops slightly fruity so that the pear can also be filtered out. The durability is very good - without problems +8 hours I perceive it on myself, on the clothes he probably keeps forever. The Sillage is in any case above average strong, not completely room-filling, but it goes into the 1-2 meters range. Target group are definitely young people under 30. I find it just inappropriate from then on, because you simply notice this youthful daredevil image in this fragrance. In the club and in winter in my opinion very well without problems wearable - For the price a buy recommendation to all, which like sweet smells from the mainstream rail (1 million, Le Male, Invictus etc.) But caution - to some it could be a touch too feminine. I do love sweet scents/fragrances but not overly sweet, this just punches my nose with an uppercut of vanilla, pear, cinnamon, lavender and amber with the hint of bergamot, and lemon. That Vanilla and Cinnamon brings the sweetness of this fragrance. I think this should just replaced Le Male as a clubbing fragrance period. It projects like a boss, compliments galore and a beastly longevity and performance. Best suited for fall and winter nights, not just for clubbing, a date night and causal night out as well. Is a must have. Longevity/Performance: 9/10: Lasted on my skin/skin scent around 12+ hrs beastly mode. Usually I’m not into sweet fragrances, yes I do enjoy an ocasional vanilla/tonka one as muchas the next guy but that’s as far as I go with sweetness. Ultra Male dares turn sweetness up to 11 which should make this annoyingly sweet and unwearable but it somehow works perfectly. Seductive, daring and unique, the ultimate clubbing fragrance. My girlfriend gave it to me as a birthday present and was it a good one! I used it for dinner that same day and it was a total hit. The Ultra man is no Casanova! At the end of 2018 I dared to approach the fragrance palette of JPG and of course started with the classic and founder of this series of beautiful flacons. The last in the bunch and my collection. was the very one in dark tones and with the ultimate claim of masculinity in the title. In addition to Essence, which is one year younger, the dark sailor is a much-anticipated bottle on the shelves of all perfumeries. At the same time, he claims to address a young target group, to which I also count myself. He is preceded by the reputation of a party scent, sometimes even a Casanova water. At least the first one I would like to contradict, the dark sailor already seems seductive and enormously attractive to me, but he doesn't scream for attention but rather for intimacy. It surrounds the wearer with an extremely sweet aura, fresh in the first minutes, then heavier, which invites the wearer to approach it in order to be able to sense the depth structure of the fragrance. The greater the distance at which the fragrance is perceived, the more one-dimensional it appears. As you get closer, however, other nuances reveal themselves - spices, woods and vanilla come to the fore - creating a homely atmosphere. From a distance I always sniff the sweetness of an overripe pear, behind whose façade the depth of the entire bouquet reveals itself. After a good hour, the light-fleshed sweetness of the pear becomes darker than the pod of a vanilla. The spicy components help to create more depth. His territory is - in my opinion - less the dance floors of clubs or overcrowded events, because he can't set a counterpoint in a sweating, agitated crowd and doesn't stand out. I like to wear it alone in a feel-good atmosphere with a good book on the couch. However, the fragrance finds its purpose in one-to-one situations in which you want to cast a spell over your female counterpart. For other men, contrary to its martial double sentence "Ultra", the fragrance is more feminine and androgynous. For younger women, it conveys closeness, security and self-confidence. The wearer also needs the latter if he does not want to appear superficial with a very sweet, extremely seductive scent. Its season is definitely autumn and winter. Its time of day is darkness, in which it would also be wearable on fresh spring and summer nights. However, more suitable variants are available here. The outfit to be combined is, as with the entire "Le Male series", a well-fitting shirt or polo with an optional jacket, here I prefer dark blue as the basic colour. Within your own four walls, as a pure feel-good fragrance, it can also be combined well with a "favourite piece" (sweater, hoodie). The durability and Sillage are neat, but I don't think they are outstanding. After two hours it gets very close to my body, which is why I don't see it as a party scent. In fact, it unfolds almost better on clothing than on skin, because then even after a day a super pleasant essence of the base notes is still perceptible. Through so many positive experiences of others, I have also become aware of the fragrance. Test Eiso! On my skin the scent is very sweet but also slightly spicy, difficult to describe. Anyway, it smells so artificial. But there are already many comments on the fragrance:-). In my opinion the scent is unique, which I always prefer or think is good. But to me the smell does not fit personally at all or not well. I associate the scent with a 20 year old young man who has the intention to get a girl into bed in the next club as soon as possible and that as a routine. As vocabulary somewhat vulgar but in girls adapting exactly to the situation. So much for that. I don't want to label the fragrance as bad, but merely as "not suitable" for me personally. Who's the scent to now? That's for everyone to decide for themselves. In my opinion, this is more for younger people who like to stay in the club, want to perform and see themselves as a traveler in the positive and negative sense. The stuff is in the first two hours a daredevil through and through, I can not really describe the smell, but he is definitely sweet.after two to 3 hours he loses unfortunately in intensity and sillage, which I actually find very sad.the first 10 minutes after spraying on he is very strong and you also smell a clear fresh out these disappear but with time and the smell becomes warmer and warmer. First day but liking it. First time trying this today so this review will not be as detailed as others, not that I have anywhere near as much as experience as many people on here anyway. The opening is very sweet with a nice dominating pear, complemented by lavender and a small amount of mint which becomes more prominent as the pear dies down. The heart of the fragrance is where the spice comes in with a great cinnamon scent dominating. On the base I get a great mix of vanilla and amber that seems to be lasting a very long time on my skin. The presentation of this EDT was different to any other fragrance that I had previously purchased. The bottle came sealed inside a large tin cylinder, pop off the bottom of the tin and these sits the male torso shaped bottle held tightly in place on the inside surface, very well presented. - Versatility: Clubbing, Nights out. Possibly office & social events if you hold back on sprays. in my TOP 3 favorite fragrances, best fragrance for the club or for "fun occasions", the first time I put it on has absolutely knocked me down, such a unique fragrance character. Can't really describe how he smells. I wouldn't have smelled the pear note now. Simply very sweet in a very special way. Performance is extremely good. Perfect for the cold seasons, perhaps also in warm seasons in the evening to go out if it is not too hot but by no means during the day in summer! "Must have" for everyone under 30! Performance is very good on this and should last you a full night out with really strong projection. I hear it is quite popular for clubbing, but not as popular as something like Eros or Sauvage so not super unique but not everyone will be wearing it. This is very very sweet though so would only recommend it for playful situations like clubbing. It's good at what it does and is defiantly a crowd pleaser although not my favourite, but I wear it because others will like it. If you are a gourmand scents lover you found your masculin top fragrance. Very enjoyable opening (pear note dominating), development (cinnamon note dominating) and dry down (vanilla note dominating). Exceptional quality in the componments are the only explanation for the joy you get from the notes composed in a fantastic blending. No, Ultra Mâle does not last for 24 hours in a row. But let's be serious. Nobody expects more than 10 hours of longevity in a perfume. There is no practical use for it. If you are a perfume lover, the most natural decision you face every day is "what will I use in the morning?" and "what will I use in the evening?". Most certainly you will use two different fragrances. In fact, the usable longevity for a normal fragrance is up to 8 hours maximum. And if ("if" in bold) by any reason you require 12 hours longevity from an average EDT without respraying, just apply two sprays per spot in your tshirt or shirt where most EDTs last a lot longer. - Opens with a very agreeable fruity (pear), citrusy, freshy and minty scent. (1/2 hour). - Continues with a fainting sweet pear note and a very agreeable cinnamon becomes dominant (1 hour). If you re-spray after 3.1/2 hours the dry down of the first spraying is combined with the opening and middle notes of the re-spray and you get 3~4 hours more of a very acceptable longevity. 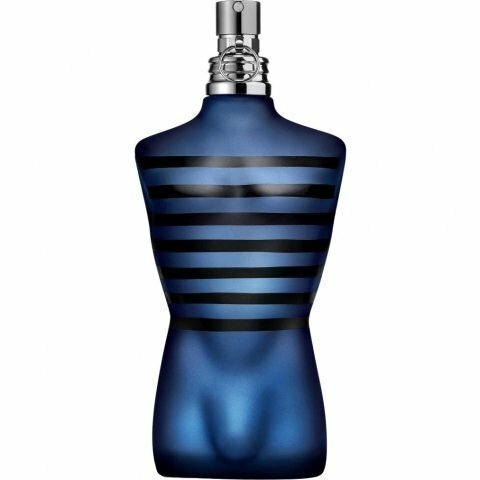 - Ulta Mâle is an above average, nice quality spicy gourmand intense EDT available for you to purchase it for a medium~high price. To wear this fragrance is a lot of fun. Most ladies will like your scent and hardly you will find a better scent for clubbing. Similar fragrances include (cheap) Zara Gourmand Leather, and Paco Rabanne Pure XS or Carolina Herrera 212 VIP Black (both more expensive than Gourmand Leather but less expensive than Ultra Mâle). Blind buy worthy? No! Test it on your skin before any buying decision. It may be too sweet for you. Music: The Archies – "Sugar Sugar"
Clubbing king! Very sweet start and spicy drydown.